Skye Jethani is touring the blog world today. 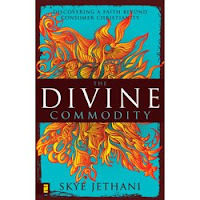 I was invited to ask Skye a question about his new book, The Divine Commodity. I found the book refreshing. It was well written and addresses a key issue we must all face. Here is the question I asked and Skye's response below. Skye, what is the most extreme example of consumer-oriented Christianity you have seen or heard about? How do I pick? I’ve read reports of churches raffling away prizes like homes and SUVs to visitors. The idea is that if you visit the church during a certain period, you can enter a drawing to win a new Hummer. That’s pretty shameless, but at least it’s obvious. I’m actually not as worried about these kinds of extreme examples. What worries me are the more subtle, and therefore more insidious, ways consumerism creeps into our communities of faith. As the Godfather once advised, “Keep your friends close and your enemies even closer.” Well, in many ways I feel like the church is often blind to its greatest enemy, consumerism, because we’ve gotten so cozy with it that we can’t even see it anymore. For example, at my own church we had a policy that we could not use the word “need” when seeking to recruit ministry volunteers. So, rather than saying “The homeless population in our county has grown significantly and more workers are needed at the shelter to care for these people with whom Christ identified.” We might say “Come experience the joy of serving the poor by volunteering at the homeless shelter.” The appeal was usually to a person’s self-interest rather than obedience to Christ or the need of others. Over time this very subtle linguistic device ends up strengthening consumerism’s message that self-satisfaction and desire is the center of life and the primal determining value when making decisions. Most people would never see consumerism lurking behind the way an announcement is presented at a church gathering, and I don’t think most church leaders are using these appeals to self-interest intentionally. But once you know what to look for you may begin to see consumerism’s ugly face everywhere. That’s what The Divine Commodity is intended to help us do—uncover our blind spots and help us deconstruct the malformation consumerism has inflicted upon us and the church. Skye's observation is very much the same as my own thoughts found in Organic Leadership (pp. 60-61). I also see that the more subtle expressions of consumerism are the more dangerous influences because they are accepted as normative and even spiritually correct. This is an important book Skye has written. Consumerism is an infection in the body of Christ that is crippling us. We simply must stop competing with one another for parishioners. Our true enemy is not flesh and blood, nor the bricks and mortar of the church around the corner. I am grateful Skye wrote the book so well, because it's message is important and we need to listen to it. This is not a book you can simply skim read and get the idea. You have to actually read this one, but you will not be disappointed if you do. With my art background I was especially was drawn to the use of Vincent Van Gogh in Jethani's writing. You may be asking, "What does a one-eared, depressed, post-impressionist painter have to do with consumer-driven Christianity?" If that alone intrigues you go get the book and read it.